Uses itself to test itself! Jarvis tests are just simple functions that run whatever code you want. To run the test, pass the function to Jarvis.run(). That’s it. If running tests using Node, there are several more options. You can still manually run tests using Jarvis.run(), but you can also run tests from the command line, which is probably preferred. After installing the npm module globally, run jarvis --help to view detailed options on how to use Jarvis from the command line. Jarvis will automatically use the name of the function as the name of the test, so it would behoove you to name your functions (as opposed to passing an anonymous function). To create a test suite, have your test function return an array of test functions. See the example above for a concrete example. Jarvis will automatically handle child tests to an arbitrary depth. 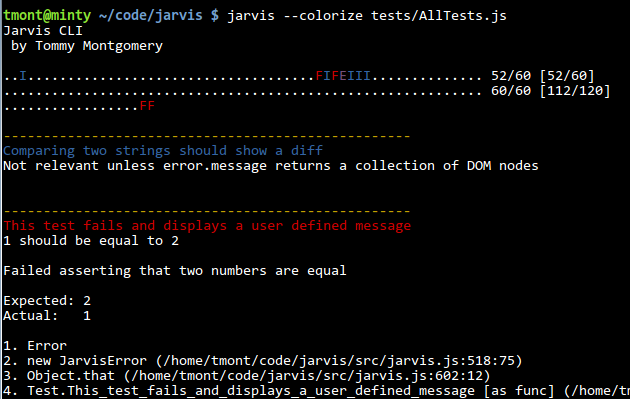 To invoke a setup and/or tear down function before each test, pass an object to Jarvis.run(). If the object has a setup property, that will be the function that is run before each test. If the object has a tearDown (notice the capital D) property, that function will be run after each test. The actual test should reside in the test property. Jarvis.run() is the function that does all the work of running the test. The first argument is a function reference. It also accepts an optional second argument to specify a reporter. If omitted, it defaults to Jarvis.defaultReporter. Jarvis.summary() prints a summary of all tests that have been run so far using the given reporter. HtmlReporter (default): reports test results as HTML. Example output can be seen in the example above. ConsoleReporter: reports test results to the debug console on Firefox (with Firebug), Chrome, Safari and Opera (with Dragonfly). CliReporter: reports test results to command line. This reporter is only usable on the server-side (e.g. Node). A boolean flag indicating whether to generate HTML diffs or not. Default is true. Note: HTML diffs will only be generated when comparing two strings using Is.equalTo() or Is.identicalTo(). A boolean flag indicating whether to show stack traces for errors and failures. Default is true. This option is only relevant for the HtmlReporter on browsers other than Opera (Opera takes a long time to compute the stack trace so it’s always disabled). Jarvis uses the stack trace library detailed here. Assert.that() is the main entry point for making assertions. actual is the value to compare against. constraint is the return value of a call to one of the Is or Has functions. Assert.willThrow() is equivalent to declaring an expected exception in other unit testing frameworks. If an error is raised after calling Assert.willThrow(), Jarvis will not report an error back. If an error is not raised, the test will fail. If errorObject is given, Jarvis will verify that the thrown object is equal to errorObject. A call to Assert.ignore() ceases execution of the test. This will not be reported back as an error. A call to Assert.fail() ceases execution of the test and is reported back as a failed test. This constraint simply performs actual === expected. This constraint simply performs actual < expected. This constraint simply performs actual <= expected. This constraint simply performs actual > expected. This constraint simply performs actual >= expected. This constraint verifies that actual matches the given regex. This constraint simply performs actual === null. This constraint simply performs actual === true. This constraint simply performs actual === false. This constraint simply performs actual === undefined. This constraint verifies that the selector given by actual is present in the DOM. Jarvis uses the Sizzle CSS selector engine, which is also the selector engine used by jQuery. That means any selector that you would pass to the jQuery object is valid. This negates any constraint defined above by chaining them together. For example, Is.not.empty() will negate the empty constraint. Has is used for performing assertions on objects and arrays. It is a substitute for Is and is used in the same way. This constraint verifies that the collection contains a value equal to the given value. Property names are ignored. This constraint can be negated. This constraint verifies that the collection contains a property with a name equal to the given key. Property values are ignored. This function returns an interface identical to Is. It evaluates a constraint on the value of the property given by name. This constraint cannot be negated. This property returns an interface identical to Is. It evaluates a constraint on the value of the text inside the DOM node identified by a selector. This operates on the notion that the given selector matches an element whose first child is a DOM text node. Otherwise it will not match. This property is identical to Has.text except that it will recursively go through each child node and append all text nodes. The ConsoleReporter reports test results to the console. This works on Firefox, Opera and Chrome. 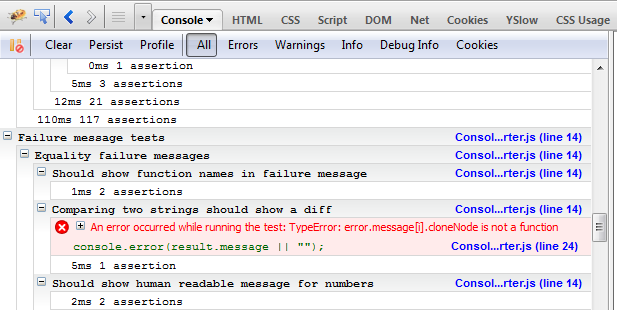 IE9’s console doesn’t support group so it just throws errors. The HtmlReporter renders a color-coded interface. If a test has child tests, it will collapse them to save space. You can drill down into each child test by clicking on the test name. The HtmlReporter constructor takes two optional arguments. The first argument is a DOM node to append the generated HTML to. If not given, it defaults to document.body. The second argument is an options object. The only option available currently is collapsedByDefault which defaults to true and will collapse all child tests by default. An example of the HtmlReporter can be seen above or on Jarvis’ own test report. The CliReporter renders reports similar to other xUnit CLI interfaces: a dot is a passed test, an "E" is an error, an "I" is an ignored test and an "F" is a failed test. An optional --verbose flag can be passed to the jarvis executable to display more information about each test. Jarvis was written by Tommy Montgomery. You can reach him at tmont@tmont.com. Report bugs or suggest enhancements either via email or on Github.